Get a load of his girlfriend Edurne, who will leave every WAG at Old Trafford desperate to raise their game next season. At 25, the stunning Spanish pop star is five years older than Alex Ferguson's new £18.3million goalkeeper. And while her music is far from critically acclaimed back home, her looks are enough to make her as big a star as the man who has to fill the void left by Edwin van der Sar's retirement. As for the new-found fame the pair will attract, De Gea is trying to keep his feet on the ground. 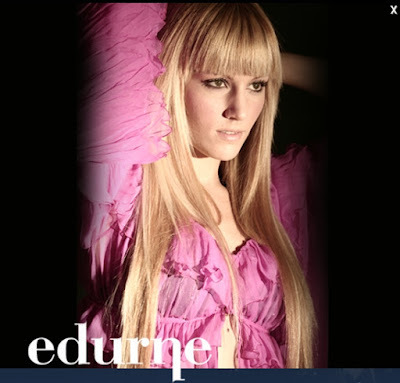 He said: "I don't think it will be a problem - Edurne will keep singing ballads and I will keep stopping balls. Everyone else can say or do what they like." Those words show the deep and serious character of the young Spaniard, who had a medical in Manchester on Monday as part of his switch from Atletico Madrid. Indeed United's new golden couple are like chalk and cheese. De Gea is not even a fan of pop music like his missus sings. Heavy metal is his thing... although he does have a touch of the old romantic in him as he lists Titanic as his favourite film. While Edurne is outgoing and showy — as our picture suggests — De Gea is very grounded. He said: "From the first moment people started to recognise me and fame has arrived, I've tried really hard to keep the same people around me, do precisely the same things as before and to stay grounded thanks to my family. "Being praised, no it doesn't worry me. One day you are being praised and the next people are on top of you. "If you keep your feet on the ground you'll never get above your station." He is a young man who has not forgotten his roots in Illescas — a municipality 25 miles outside Madrid the population of which would fill the Stretford End at Old Trafford. He goes back there to visit his old school and is a hero to the kids there. His old school master at the Castilla School is Jose Luis Garcia who describes De Gea as an inspiration. Garcia said: "David was a very, very good student. "He came from a very good family background and always had a very positive attitude. He was with us from the age of four to 17. "Academically he was very good, although not so much in English — he wasn't very good at that! "But, of course, he was brilliant at all sports. He excelled at basketball and football. He had very big hands so it is no surprise to us he's a goalkeeper. "But, for all his success with Atletico Madrid, David hasn't changed a bit. He has always been a modest lad and very down to earth. He is not big headed at all and I don't think anything will change that either. He's just very normal. "He is often back in school and always wants to see his old teachers. He brings in autographs and pictures and will always spend time talking to the children about doing well in school." 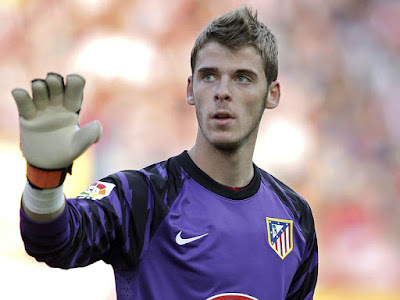 De Gea's rise has been dramatic after only 18 months in Atletico's first team. He played in all 38 La Liga games for Atletico last season, conceding 53 goals behind a defence which made West Ham's look like a fortress. But boss Ferguson saw something he liked way back in September. Which is why he kept track of De Gea all season and finally agreed to pay £18.3m for him last month. His judgment is backed by some of the biggest goalkeeping names in the game, including Spain's current No 1 World Cup-winner Iker Casillas. De Gea helped Spain win the Euro Under-21 title by beating Switzerland 2-0 in Saturday's final. En los últimos meses, Edurne y David De Gea han aprovechado para pasar todo el tiempo juntos porque sabían que ahora, al comenzar la temporada, tendrían que separarse. El portero terminó su contrato con el Atlético de Madrid y se marchó a la Liga inglesa para jugar en el Machester United, algo que debidó entristecer a la cantante ya que a pesar de estar muy orgullosa de él por haber fichado por uno de los equipos con mayor historia de Europa, ella tenía que cumplir con sus compromisos profesionales en España y sabía que no podría estar con él todo lo que le gustaría. Aún así, hoy en día las redes sociales son la mejor forma de mantener el contacto y por ello, desde que De Gea se fue a vivir a Manchester, la pareja no ha dejado de dedicarse románticos mensajes que demuestran una vez más que lo suyo va muy en serio y que se echan de menos. "A varios cientos de kilómetros, puede tu voz darme calor igual que un sol...", publicaba hace unos días la ex concursante de Operación Triunfo en su cuenta personal de Twitter. Edurne sabía que este fin de semana era muy importante para el futbolista porque iba a jugar su primer partido con el Manchester y volvió a recurrir a la popular red social para mandarle todo su apoyo desde la distancia: "Hoy es un día muy importante para ti, tu debut con el Manchester United. Disfrútalo, te estaré apoyando desde aquí!! Eres el mejor! ♥". El partido no pudo ir mejor y tras el encuentro David escribió en su Twitter: "Primer partido con el Manchester! Muy feliz! Victoria 3-1. Increíble el ambiente en Chicago. Un saludo a todos". Sin embargo, todavía quedaba la mejor parte ya que el portero no se había olvidado del bonito mensaje que le había dejado su novia y quiso dedicarle un tweet muy especial: "Gracias por estar siempre apoyándome!! Te quiero!!". Enquanto alguns dias atrás eu falei dos parceiros potenciais que formam a cantora Shakira eo futebolista Gerard Piqué , o fato é que um novo casal que eles poderiam lançar uma sombra sobre as questões da atenção da mídia e é a forma Edurne , conhecido como " Idol "eo goleiro do Atlético de Madrid, David de Gea. Para o momento, o suposto romance entre Edurne, 25 e Gea De , 20, não foi nem confirmado nem negado por ambos, por isso está em evidência ea especulação até novo aviso. Sim, parece que a chama do amor veio quando os dois concordaram em gravar um dueto um villancinco apoio em novembro passado. Até agora, as revistas de ter apanhado o casal andando pelas ruas, fazer compras e almoçar e, embora eles não implicam que são mais que amigos, vemos que entre os dois existe alguma cumplicidade. On a beau être une sublime femme, on peut aussi avoir des travers. Ainsi, Edurne Garcia Almagro la compagne de David De Gea, le gardien de l'Atletico Madrid, n'hésite pas à le faire chanter. Edurne Garcia Almagro a mis depuis quelques semaines le grappin sur David De Gea, le prometteur et courtisé gardien de but de l'Atletico Madrid. Et forcément, celle qui a terminé 6e de la Star Academy espagnole en 2005, a participé à la comédie musicale Grease et a été la chanteuse de plusieurs groupes de musique, doit imposer un karaoké quotidien au portier espagnol. Dur. Heureusement, De Gea peut se rattrapper sur la superbe plastique d'Edurne qui a déjà posé pour FHM. On ne retiendra que ça.